The new Ouse Washes LP Website is Live!! Today is a very exciting day as we are finally able to share our new website with the world! And a lot more – go on, find out for yourself! Do let us know what you think about the new website – we want this to be useful for you, so please help us make things better – drop us a line through the Contact section. Press release: Press release_New website for Ouse Washes Landscape now live! Conservation, Farming, Flooding: Our Natural Landscape? 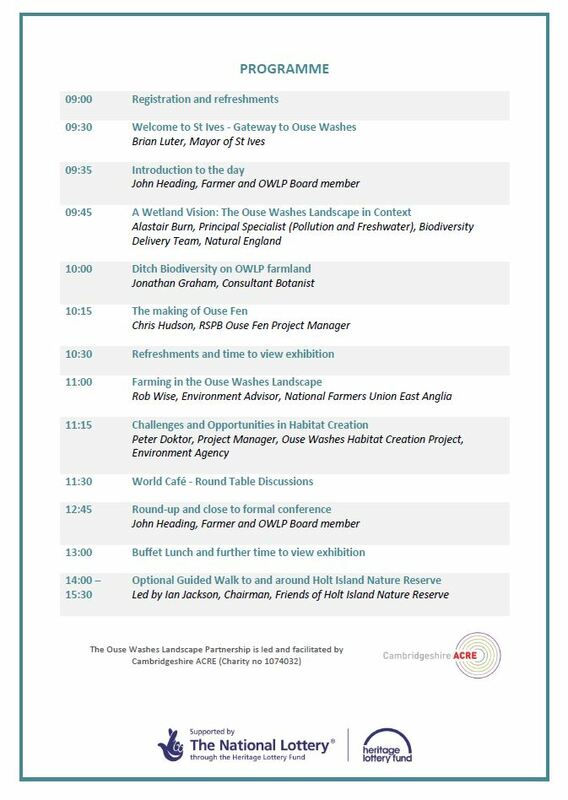 Anyone interested in the Ouse Washes area is invited to attend the first-ever Ouse Washes Landscape Partnership Conference which is taking place on Wednesday 19 November from 9am – 2pm at The Corn Exchange in St Ives, Cambridgeshire. 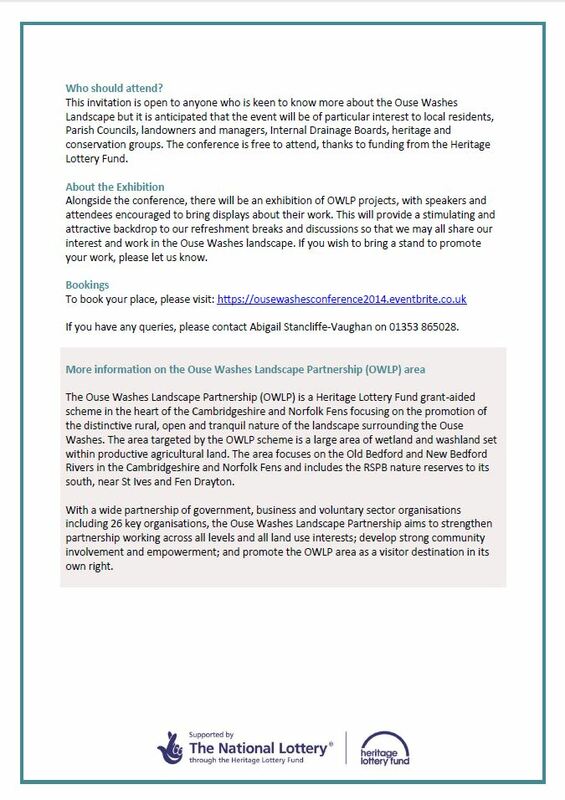 This conference – the first in a series of three, taking place annually – will explore the natural landscape of the Ouse Washes Landscape Partnership area. The conference aims to provide attendees with an overview of future management challenges including issues around landscape-scale conservation, biodiversity value, agricultural importance and flood relief. A background to wetland creation schemes in the area will be given through presentations with discussion facilitated in small groups regarding the future importance of the natural landscape. The Ouse Washes landscape area has a multitude of different uses. It has an important role in flood risk prevention; it is made up of high quality agricultural land; and its internationally-renowned nature reserves provide a vital home for wildlife. This conference will look at whether these competing uses can be reconciled and balanced whilst making the area a great place to live and work. The Partnership aims to increase awareness of the significant natural heritage of the area. Bringing together local people and partner organisations with a range of land-use interests will promote a wider appreciation and understanding of the challenges of living and working in this ever-changing landscape. Download the Invitation and Programme , or see depicted below: Time has been allowed for opinions to be aired, giving all attendees a chance to contribute to the wider debate about the future of the Ouse Washes landscape. Change will continue to be a feature of this rapidly evolving landscape and the views and ideas generated by attendees will feed into the OWLP legacy planning work, with clear recommendations and actions coming from this conference. The Ouse Washes Landscape Partnership’s central team looks forward to receiving your booking, and information if you want to book a display/ exhibit space. Fancy an active but charitable weekend out in the Ouse Washes? 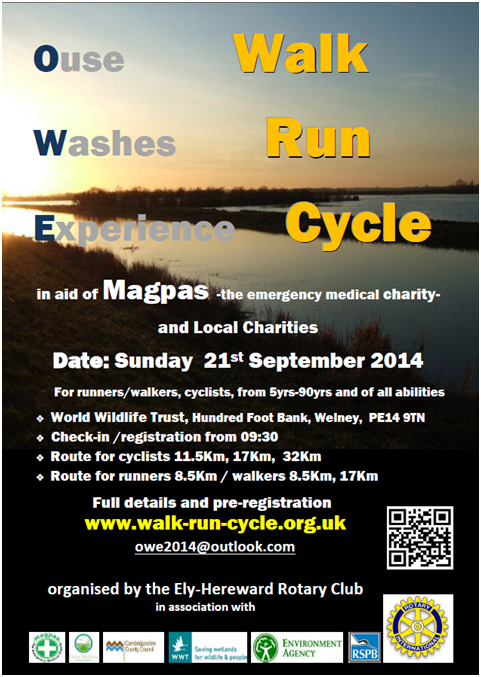 Join The Ouse Washes Experience on the 21st September 2014 and raise money for the emergency medical charity Magpas amongst other local charities. Walk, Run or Cycle. It’s your experience, it’s up to you! Founded in 1971 Magpas is a unique charity which offers support to the ambulance service. The charity heavily relies on public donations to provide the Magpas Helimedix Air Ambulance and rapid response cars. The Magpas Specialist Medical Teams attend to cases of life threatening illness and major trauma throughout the East of England. Operating 18 hours a day the teams are staffed by highly trained Pre-Hospital Doctors and EEAST Paramedics who volunteer their own time to work with the charity. Get Involved- all are welcome! The Ouse Washes Experience is organised by The Ely-Hereward Rotary Club in cooperation with the OWLP Scheme, WWT, RSPB, Environment Agency and Cambridgeshire County Council. It is a sponsored event with 3 routes of varied lengths running adjacent to the Old Bedford River between Welney and Welches Dam. For cyclist there is an extended route. It is a great opportunity to get out and enjoy the unique and beautiful landscape of the Ouse Washes. Come and enjoy the wildlife and many other attractions the area has to offer, take in the fresh air, keep fit as well as raise money for charity through your sponsorship. 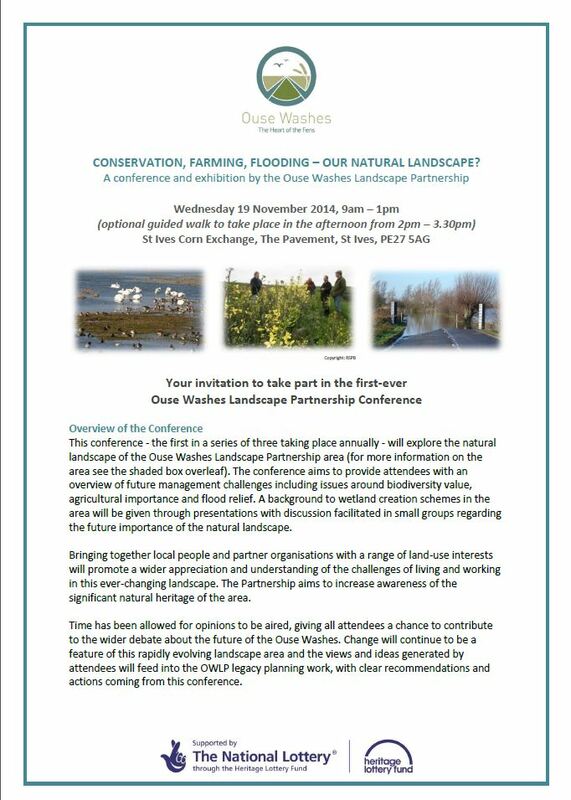 The Ouse Washes Landscape Partnership Team will be there to provide information on the OWLP Scheme as well as participating. So take the opportunity to learn about projects going on within the area. Whether you are a keen walker, runner or cyclist, or if you just want to get out and about… join in! Whether you are participating individually, as a family or as part of a group come and experience the Ouse Washes! For further information or to register for your own Ouse Washes Experience please visit The Rotary Club of Ely-Hereward website. 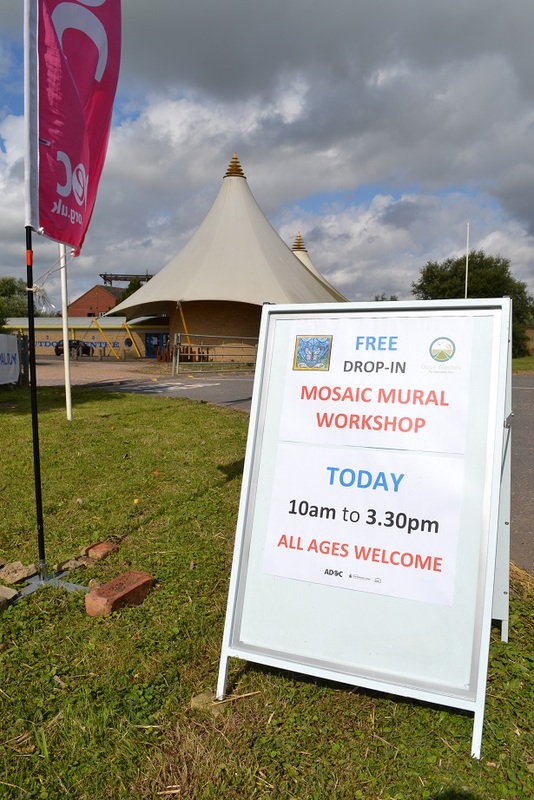 Myself and Abby involved and enjoyed ourselves with a couple of events lately – the Community Murals Project at Mepal last Thursday and the RSPB “Your local home for Nature” event at Fen Drayton on the Sunday. We went on behalf of the Ouse Washes Landscape Partnership team wearing our OWLP T-shirts to support the project and our partners. I helped out with creating the clouds in the mural, which was becoming a fantastic piece. It began to stunningly show the landscape and its wildlife in a large mosaic of beautiful flakes, jewel-like pieces and many colours. From its half-completion upon our entry at Mepal Outdoor Centre, it was quickly getting pulled together during the afternoon we were there, and I couldn’t wait to see the finished product! Few mothers and their children were hard at work being creative with glue, cutters and boxes of mosaics. 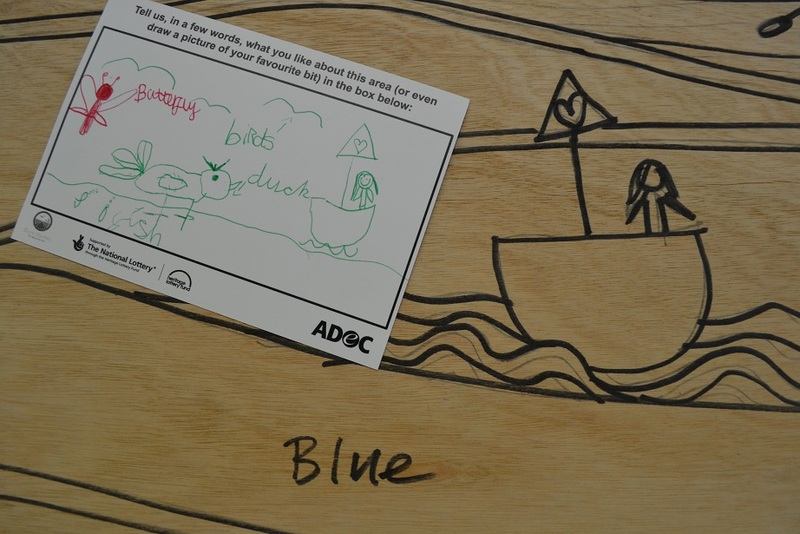 We filled in the pictures drawn onto the marine plywood base and talked about the work in progress under the attentive guidance of artist Carolyn Ash. Several people came and went to admire or help out, and Abby took photographs, a video, notes and interviews to evaluate the event. They expressed positive enthusiasm and fun in the activity that brought out more understanding and appreciation of the landscape we are promoting. We were back into our T-shirts the following weekend as part of the RSPB open day event at Fen Drayton. I have often sped past on the Guided Busway, so it was great to be able to be on site for a change. We offered tasters of Ouse Washes Honey produced by Robert Taylor from Manea, and our mug game with Ouse Washes messages and jelly worms. We gave out promotional postcards with our contact details and website address under our banners and with the Heritage Lottery Fund posters. We explained and engaged people into our OWLP scheme, including about the Community Heritage Fund. 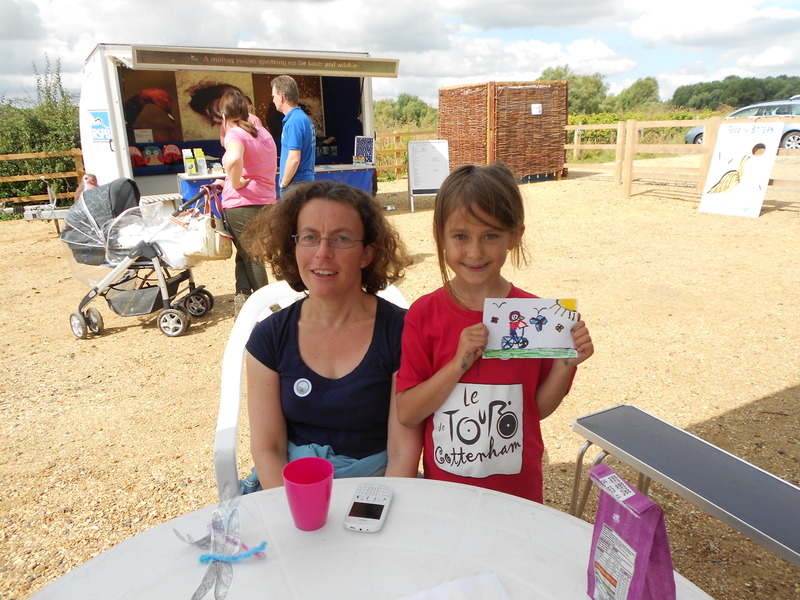 We served tea, involved children to draw ideas they have about the Ouse Washes landscape and I stuck on alot of our OWLP stickers! 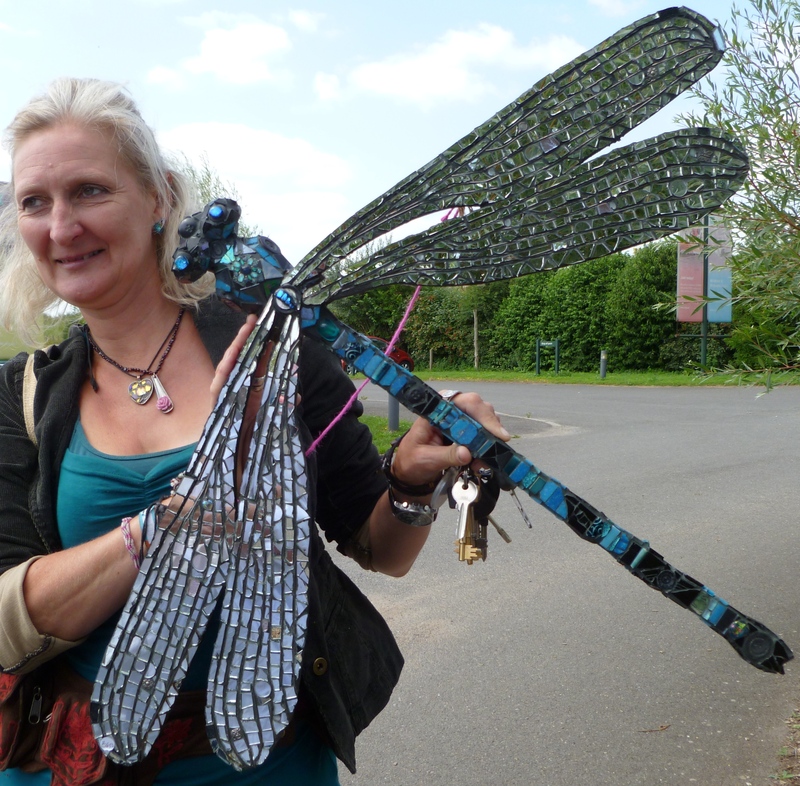 I also helped out the RSPB by making dragonflies with children and met some lovely RSPB people at this small event. I would be glad to come back again and explore more of Fen Drayton and build up my experience promoting OWLP at future public events. See the next event the OWLP team will be at, which is Haddenham Steam Rally on the 6th September! Get into Mosaic-making this Bank Holiday Monday! 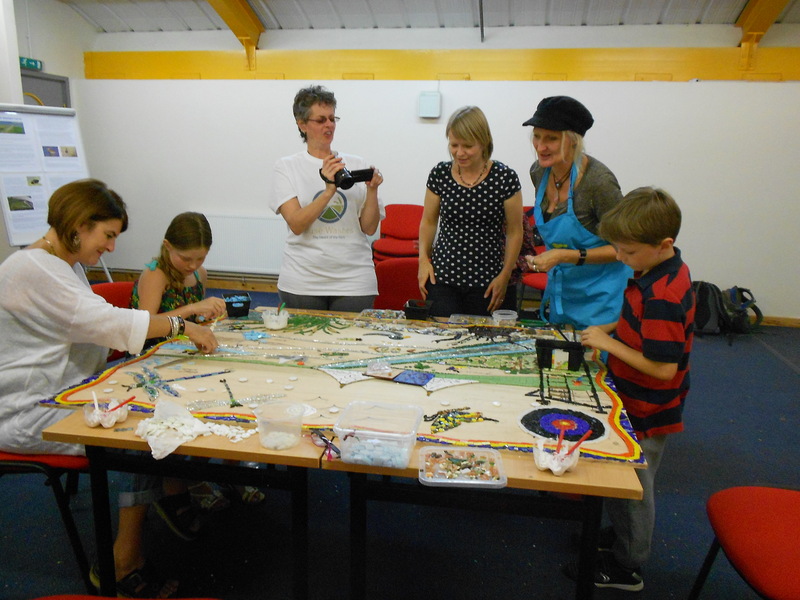 The Ouse Washes Community Murals Project starts at Mepal on Bank Holiday Monday! Mepal is the first of the three places in our special, but little-known, area of East Anglia which stretches from Downham Market to St Ives that will have outdoor murals made by you and others in the communities from across the landscape! For free! You can freely come to these crafty workshops whenever and for however long you want all the week until end of Friday 29th August, and the workshop is held for one more day on the following Monday the 1st September. Anyone can have a go regardless of age and ability at creating these wonderful outdoors art features. Denver and Welney are the other two places and workshops will be held at these places for their murals later in September then October. It was all made possible by a Heritage Lottery Grant successfully applied to by ADeC under the Ouse Washes: The Heart of the Fens Landscape Partnership Scheme. The murals were commissioned to become a permanent and pretty landscape feature the local people can be proud of because of their involvement in the workshops of the project. The scheme was set up to raise awareness and encourage greater local engagement with the landscape of the Ouse Washes to celebrate and highlight it and its value. Your ideas are also needed – we will give you postcards at the three locations where you can write down what makes the landscape special to you for the designs. It will be led by talented artist Carolyn Ash, who will guide you through all aspects of this popular activity – it is the fun, creative and original thing to do for the whole family and to do with friends! 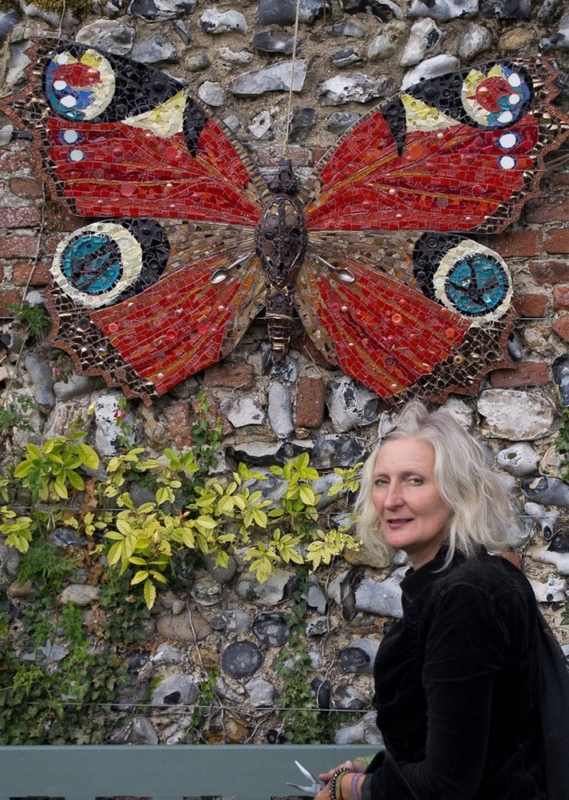 As promoted in the Ely Standard24, on the Thursday and Friday between 10am-3.30pm, Carolyn will transform the resulting mosaic into a large outdoor mural. Trot on back to the Past this Weekend! Littleport’s famous ironmongery shop – J H Adams – that had been unchanged since and restored to its 19th century state as a Heritage Lottery funded project is opening its doors again on Saturday 23 August from 10 am till 4pm. 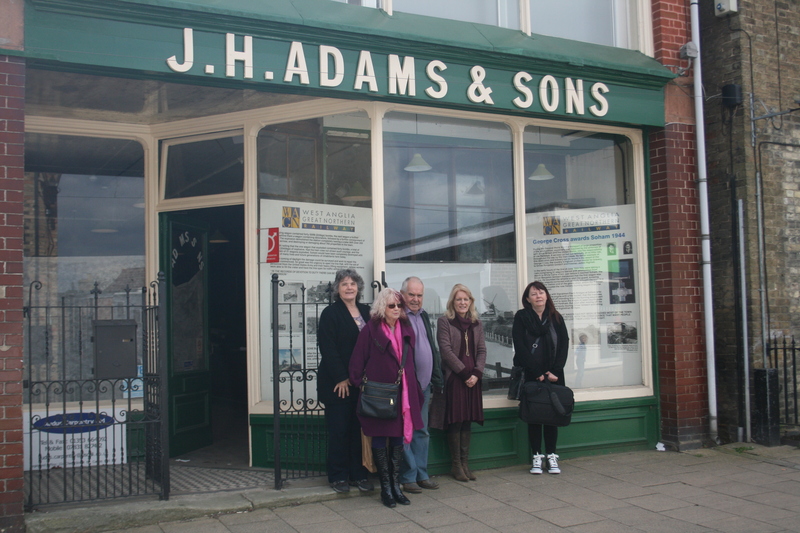 This Family Adams Project is a time capsule that documents the fascinating paraphernalia of the local shop and lives in Littleport and the Fens by displaying the items that were for sale to the shop ledgers used as well as the photographs and objects of the related past – including that of the horse, which played an important role back then. 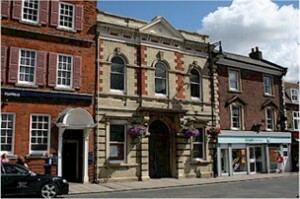 The J H Adams Heritage Centre of Main Street will be holding a second-hand book fair to raise its funds. Come and support it by having a browse through the fine selection of good quality books while enjoying teas and coffees with them! While there, you can see the paraphernalia, photographs and information of these beasts that tolled on the land and streets for man throughout the Fenland during the centuries. The shop was transformed into an old saddler’s shop that bustled with actors and a film crew back in April to create a community film about them. The Horseman’s Word is another recently finished but still continuing Heritage Lottery-Funded project ran by the Field Theatre Group, a community learning, inclusive and engagement organisation based in Littleport that combine performing arts with Fenland heritage and culture. Under ADeC and in partnership with the Wisbech, Fenland and Ely museums, the Field Theatre Group got together film makers, researchers and experts to work on a good outcome of increased interest in the true stories about heavy horses from a previous Common Ground project that gathered and taught expression of local stories in sessions and workshops. People were invited to talk to horse experts and give in historical materials like memories and photographs in workshops. A travelling museum exhibition, an on-line archive, a history field day with a local primary school, a documentary DVD and drama workshops has been coming out of it all. BBC Radio Cambridgeshire had aired an interview about this fascinating project on June 3rd last year, and the BBC took further interest in the heritage of the heavy horses lately. 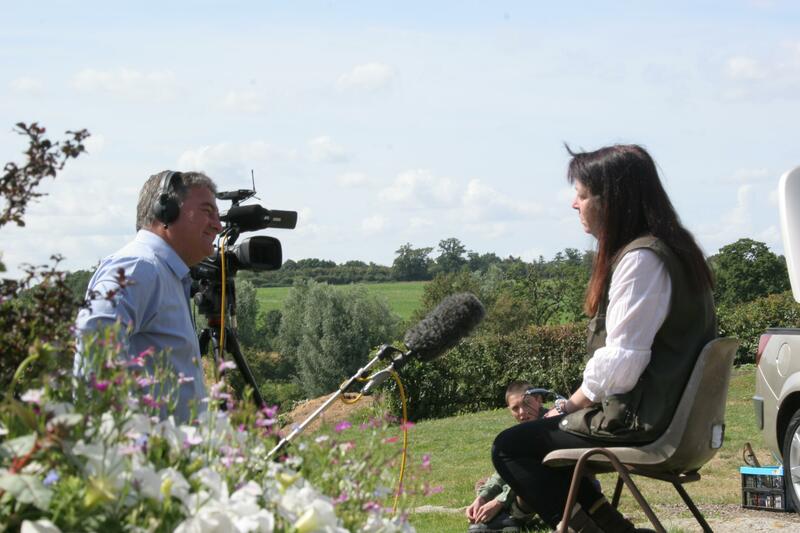 BBC Look East aired their filming of the Field Theatre Group’s filming on location for a production that includes/on heavy horses on the 6pm show on Tuesday 5th August this year, and the director, Deborah Curtis was interviewed by Kevin Burke about their activity and great work. 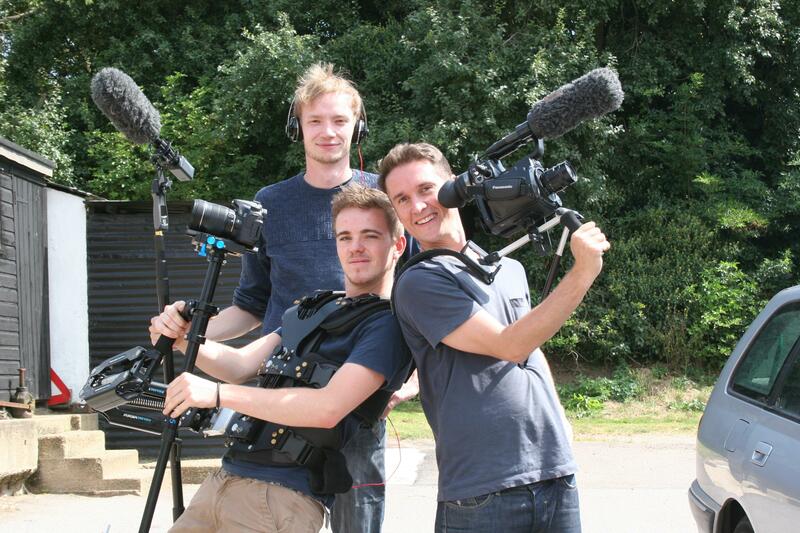 The project has grew successfully from a previous one into its glamorous conclusions of being on BBC television air time, other location shoots like near Colchester earlier this month and promoting the learning, talents and skills of the local stars from Littleport. Arts Development East Cambridgeshire (ADeC) are kicking off this exciting project on Bank Holiday Monday 25th August 2014. 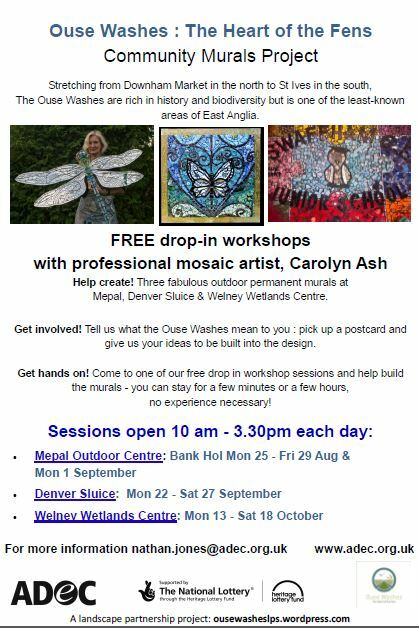 Professional mosaic artist, Carolyn Ash will be working with the community, their pottery/ crockery items, some ‘spare’ museum pieces, found materials and mosaic-ware to create some fabulous permanent murals at Mepal Outdoor Centre, Denver Sluice and WWT Welney. Postcards, and mini postboxes, will be placed at these sites for ideas for the murals or just turn up on any of the workshop days – it’s all FREE! All workshops are from 10 am till 3.30pm – wear clothes you can create in! Whilst at Denver Sluice you may also want to sample the food and drink available at the Jenyns Arms (do check opening times though) and also at the wonderful Denver windmill. There is also a golf and a sailing/rowing club in the area, a smattering of walking routes and some nice interpretation panels dotted around. It would make a great day out with lovely lunches and afternoon tea available at the Mill which is only a short walk from the Environment Agency Sluice complex. Spending a little time at Denver really helps highlight the man-made nature of this landscape. The café and interpretation areas at Welney are excellent, with a charge for visiting the reserve proper (over the arching bridge – link to earlier blog post) but lots to see and do in the centre and shop if you have time or come back another day! These practical, hands-on workshops mark the start of the Ouse Washes Landscape Partnership scheme’s projects and activities, with the murals made with local people forming a lasting record of this landscape steeped in history and brimming with biodiversity that brings us bang up-to-date! The murals will be mounted permanently at their making sites with related activities taking place during Festival Fortnight (20 – 31st July 2015 and in 2016 too). Look out for more information on our activities via this blog. "Only trust thyself, and another shall not betray thee"
News and information from Landscape Interface Studio, School of Architecture + Landscape, Kingston University, London.